Isn’t it funny how a certain food sparks a memory? In this case, a bologna sandwich. I see myself at age 6 or 7, standing in our kitchen, impish grin on my face, about to eat lunch which consisted of a bologna and mayo sandwich and a cream soda to drink. I can picture my young self in shorts and a red and white halter top that my mom made for me, chin-length light brown hair all a mess from playing outside with friends. Red light/Green light? Mother May I? Or maybe making mud pies and “selling” them? The day took a turn for the worse after lunch. Bologna, mayonnaise, and cream soda (as well as a hot summer day) do not mix well. I will leave it at that. Almost 40 years later, I still won’t drink cream soda! And only in the last couple of years have I begun to eat bologna again, with caution. This post was inspired by the topic "food" at Sunday Scribblings. Personally, you're not missing much with the bolonga. However, I love cream soda. Thanks for the memory...it was fun to read! It's funny how long you wait before trying the out the devil that bit you last time. About 5 years ago I had a dodgy Caesar salad. I had my first retry just a few months ago. Luckily I survived. I agree with Elaine, you haven't missed much with the Bologna! Great read. Now that's a vivid memory! I think I'll pass on the bologna and cream soda too! There is nothing wrong with bologna that can't be improved by leaving it in the shop. The same goes for cream soda. Whatever were you thinking of in the first place? 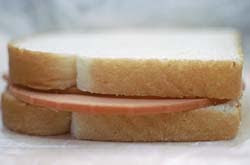 mmm, bologna sandwiches. my mom used to fry the bologna!